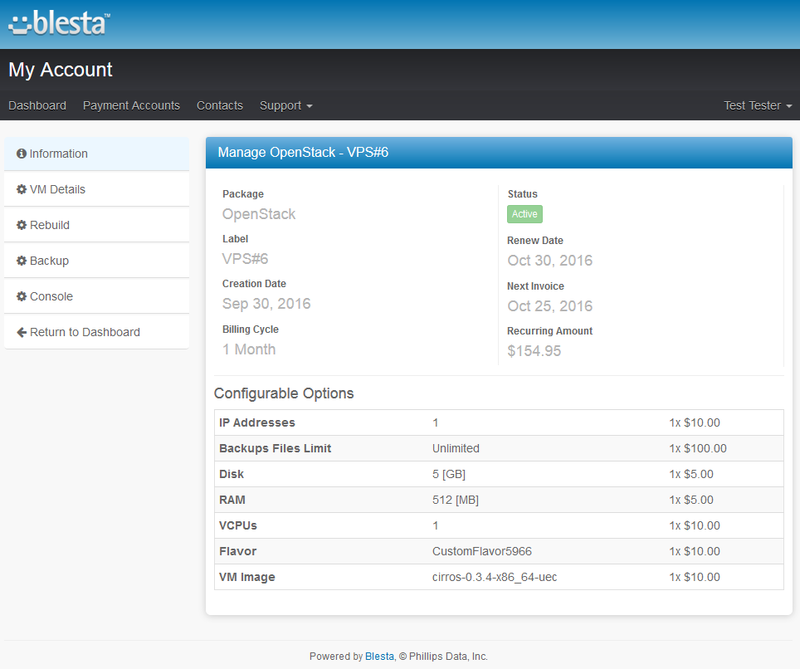 OpenStack VPS For Blesta is a module which lets you automate the provisioning and handling of customized virtual servers to your customers. 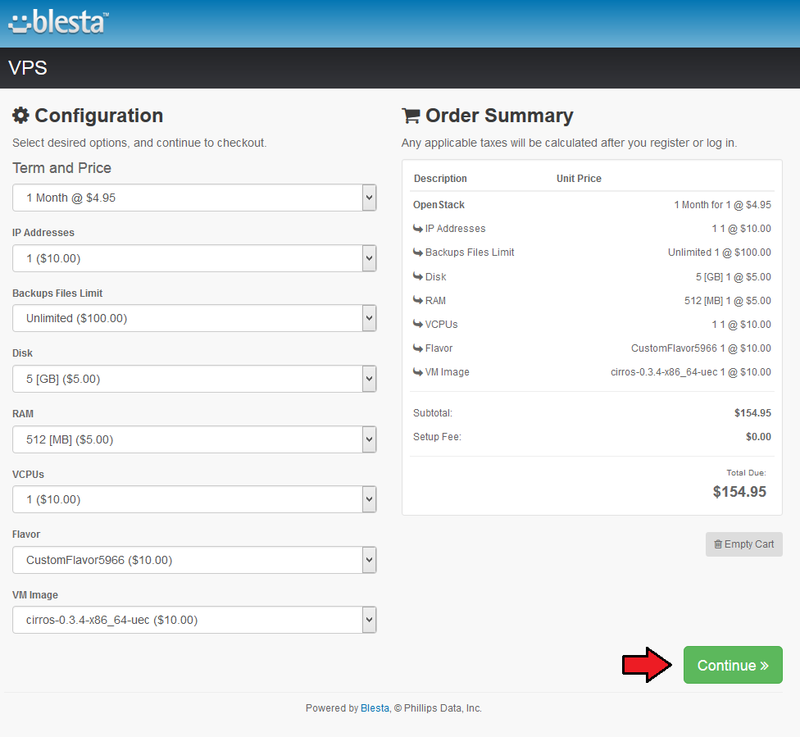 The great benefit of this module is a wide range of supported options customers can order and manage right in your own Blesta client area. Furthermore, it allows you to easily monitor and manage all the customers' servers. 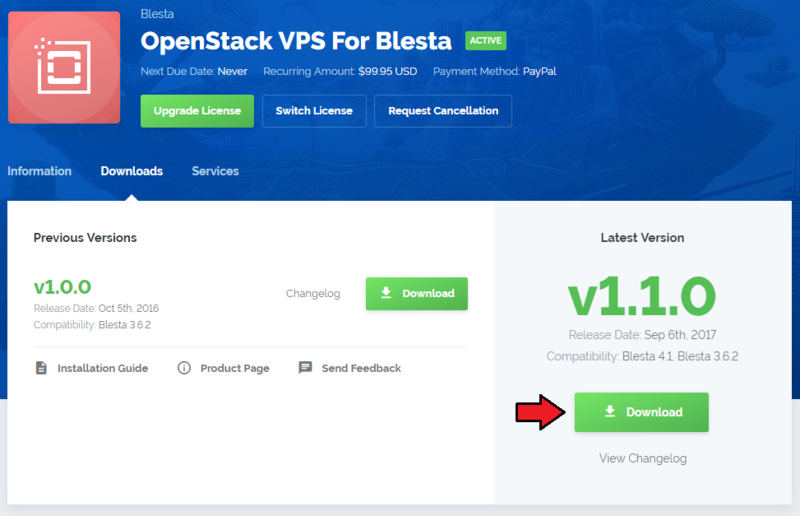 In this brief tutorial we will show you how to successfully install and set up OpenStack VPS For Blesta. 4. 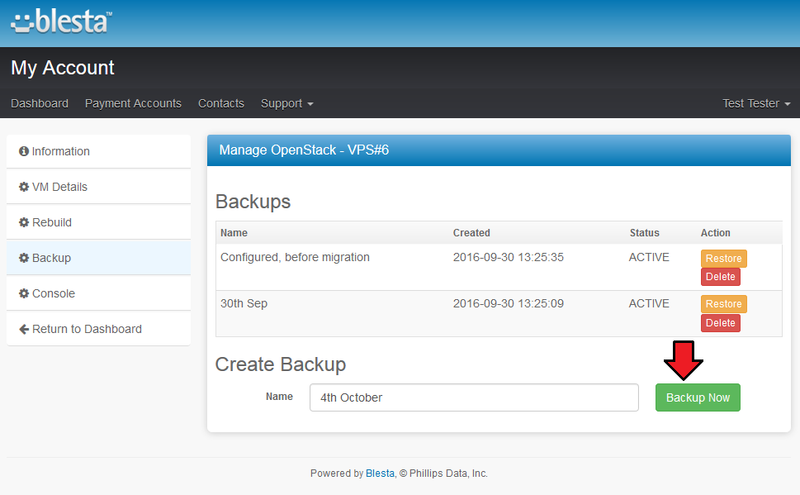 When you install OpenStack VPS For Blesta for the first time you have to rename 'license_RENAME.php' file. File is located in 'components/modules/openstack/license_RENAME.php'. Rename it from 'license_RENAME.php' to 'license.php'. Use cron job below but switch 'your_blesta' with your root Blesta path. Now, you have to install the module in your Blesta system. 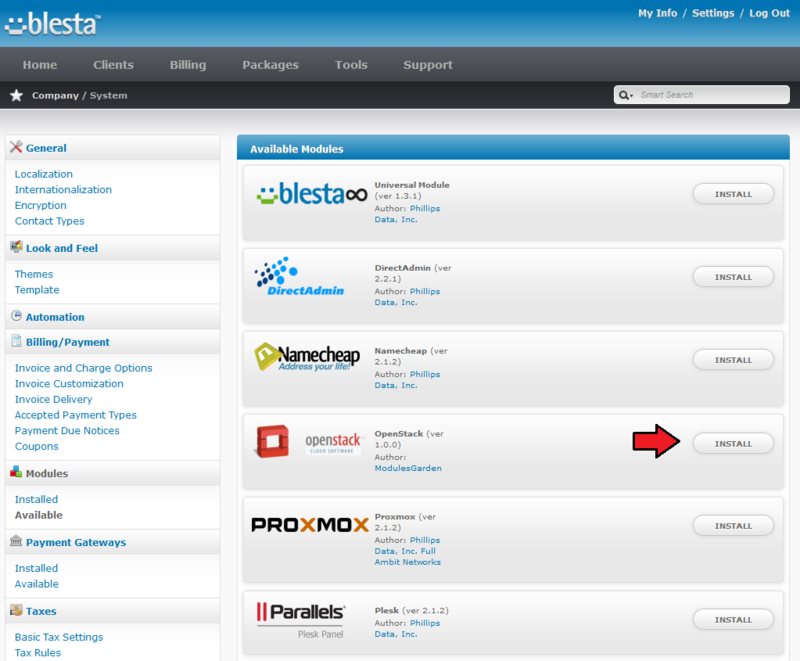 Log in to your Blesta staff panel and proceed to 'Settings' → 'Modules' → 'Available'. 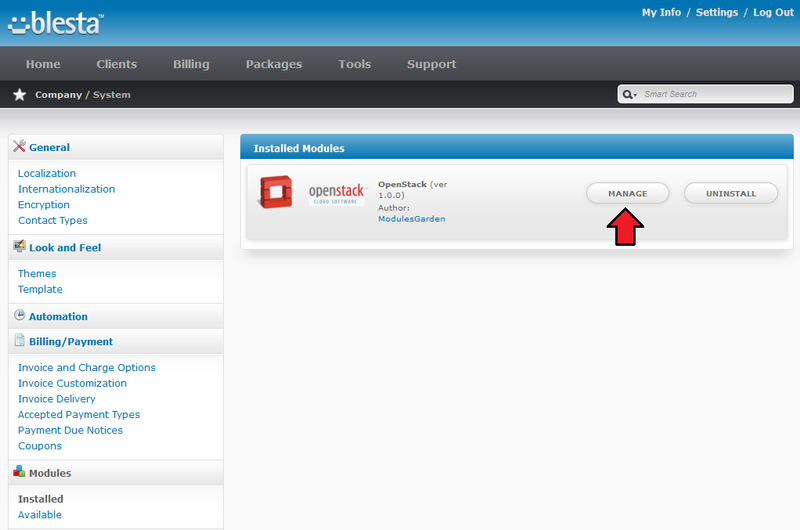 Afterwards, find 'OpenStack' and press 'Install' button. 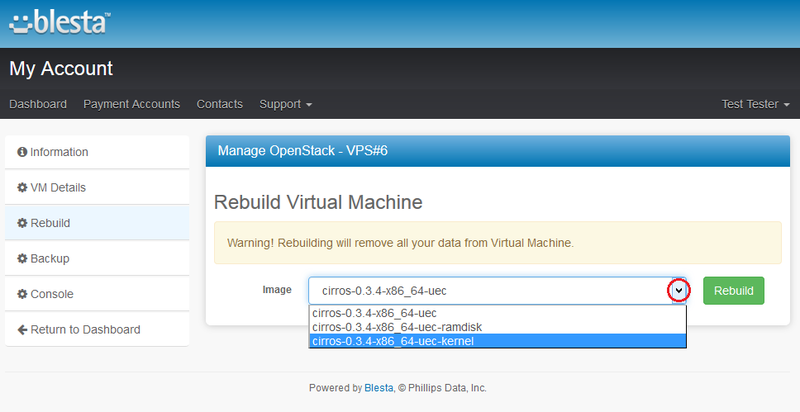 Press 'Manage' under installed OpenStack VPS module. 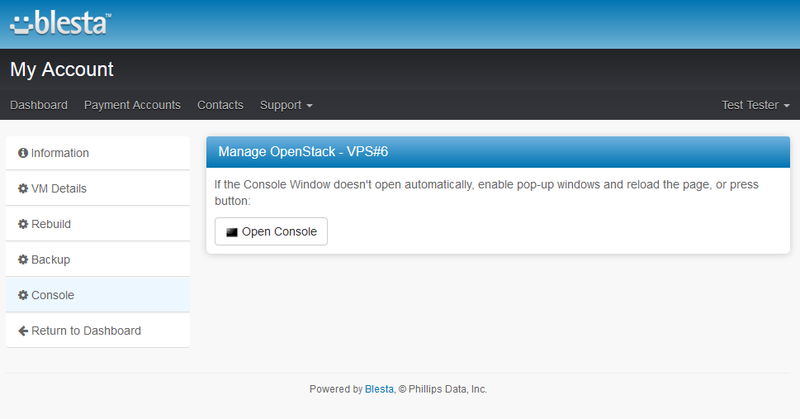 Here, you have to enter any data required to connect your Blesta with OpenStack VPS server. Finally, test connection, if it is successful save your account. At this moment you should also generate default configurable options. 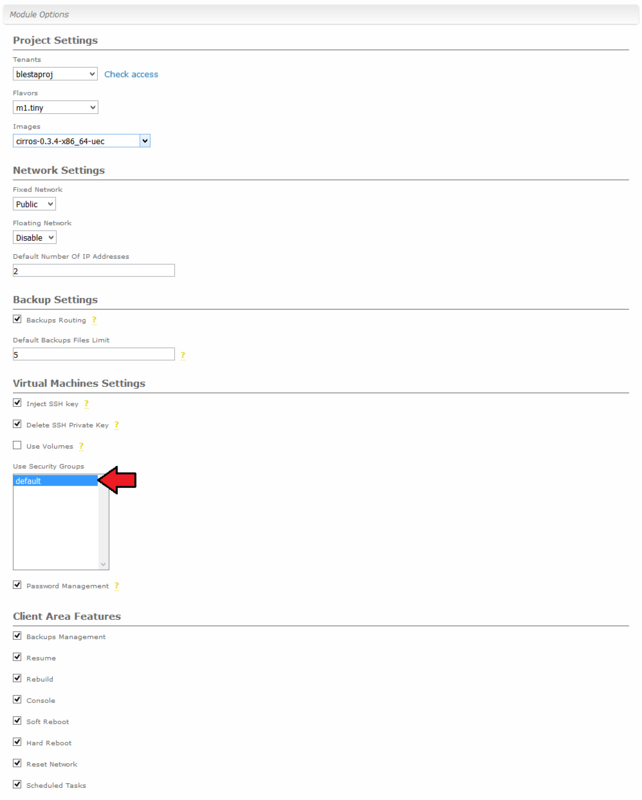 Press the button and your clients will be allowed to compose their VM within the allowed limits. That is all! 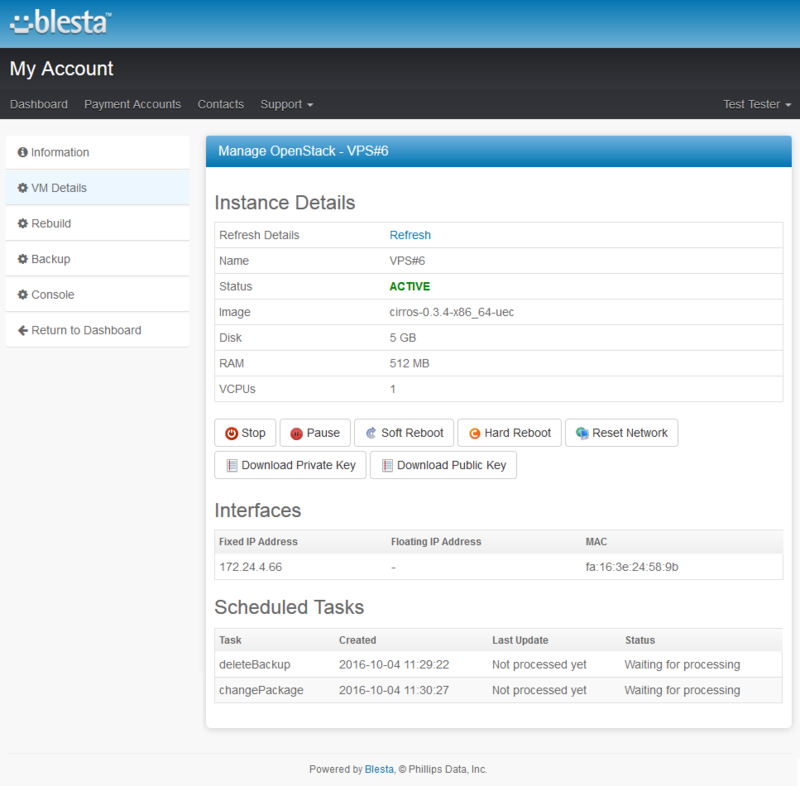 Your Blesta is now connected with OpenStack VPS server. Before you can offer virtual machines for sale you must create some packages with configured products and pricing. Go to 'Packages' → 'Browse' and press 'Create Package'. You will see an extensive form. 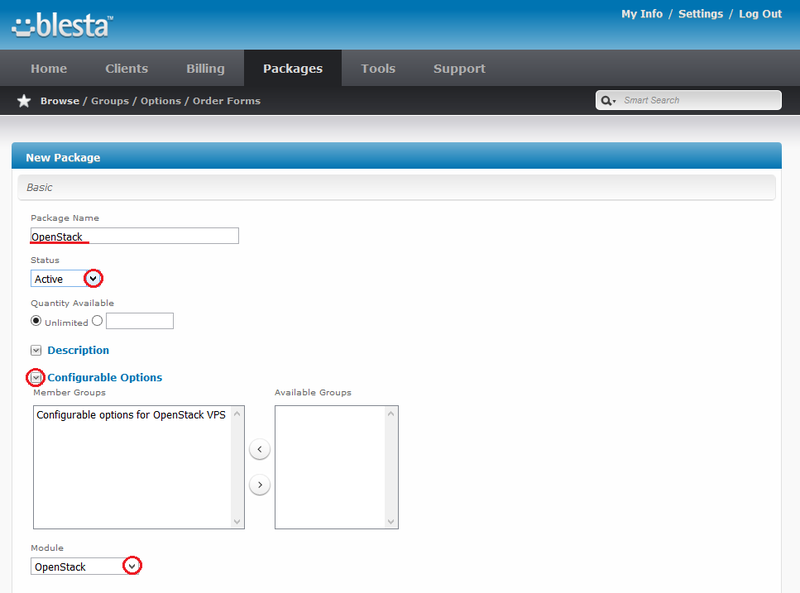 Start with naming your package, select module - 'OpenStack' and activate it now. At this moment you also have to generate configurable options that will allow your clients to adjust the product they purchase to their needs. 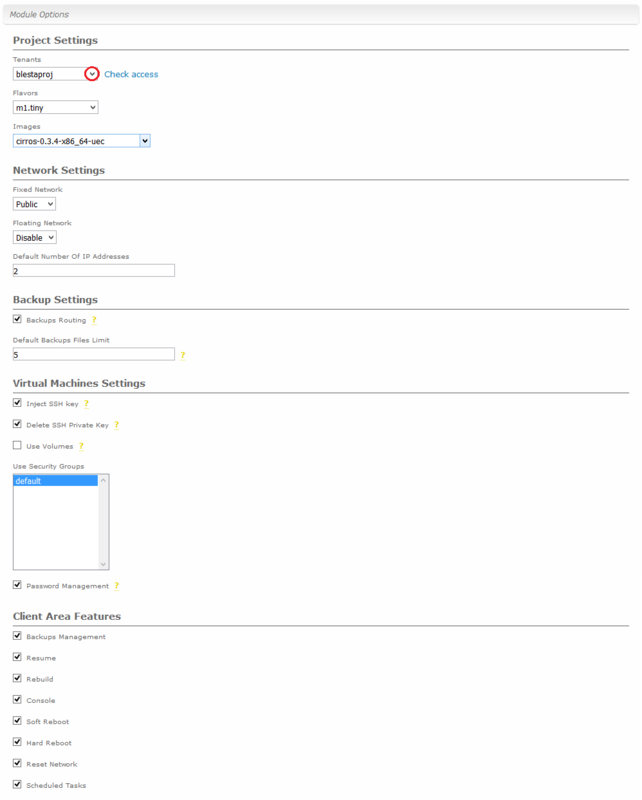 Next, configure your module options. Start from selecting 'Default Tenant'. Afterwards, set up network. Choose 'Fixed Network', 'Floating Network' and 'Default Number Of IP Addresses'. You can set up network in two ways. Find more information about the configuration here. Additionally, choose the number of IP addresses assigned to product by typing it into 'Default Number Of IP Addresses'. At this step you can set up backups. Mark security group from 'Use Security Groups'. In order to use passwords for your VM, leave 'Password Management' marked (virtualization has to support 'Set Admin Pass' feature). Finish through selecting features available at the client area. In the next step set your prices and provide the content of a welcome email if you wish. Finally, select a group to which the package will belong to. If you do not have any groups yet, you may quickly create one right now. Do not forget to press 'Create Package' button in the end. Your package is ready now, create as many packages as you need to diversify your pricing offer. Once you have your package ready, you have to create a new order form. Move to 'Packages' → 'Order Forms' and press 'Add Order Form'. 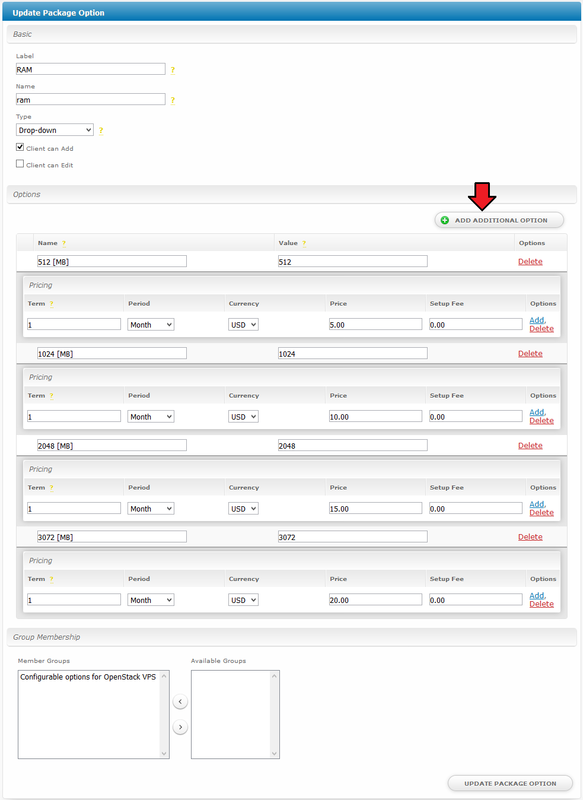 Provide 'Basic' settings for the order form that will be assigned to your previously created package. Press 'Add Form' when everything is ready. 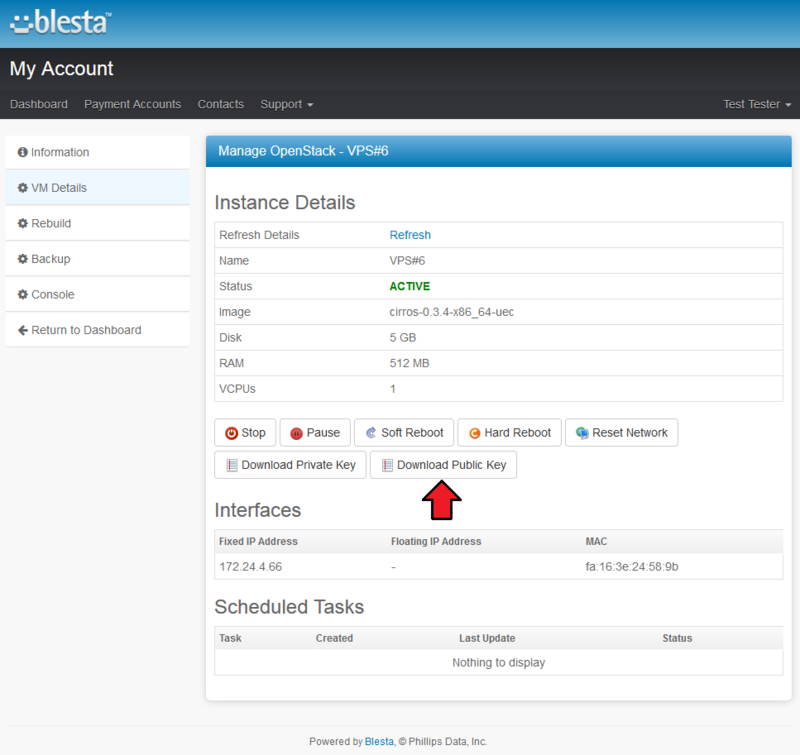 OpenStack VPS For Blesta allows your customers to manage their OpenStack VPS via client area in your Blesta system. 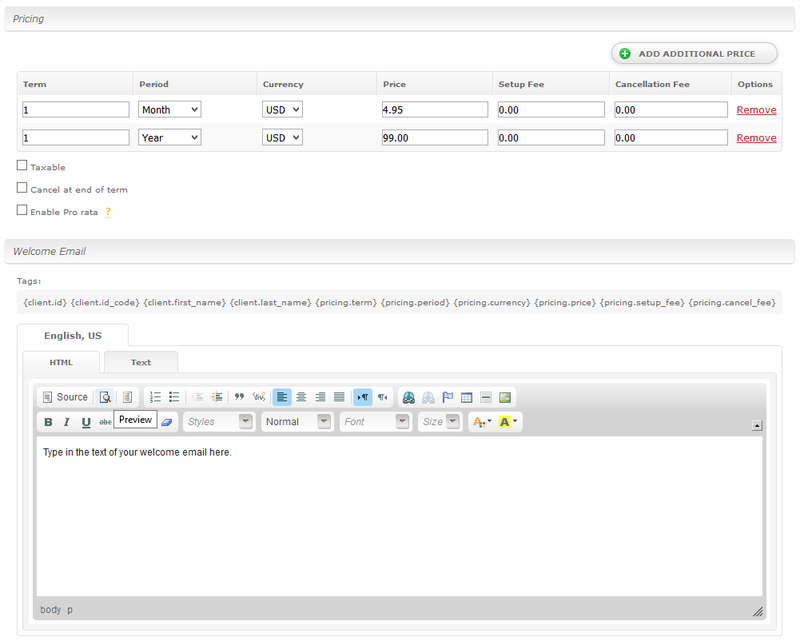 You can monitor and manage each product from your admin area. 1. Basic information on the service. 2. 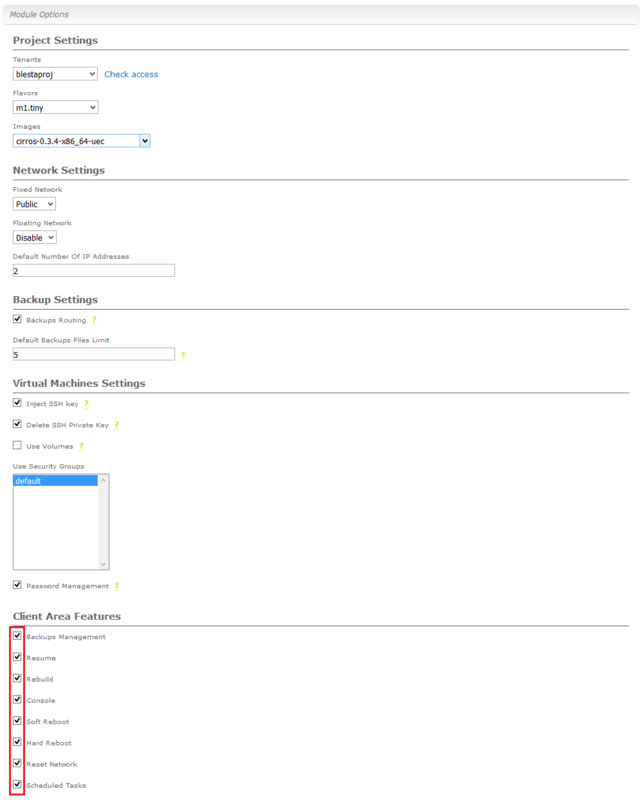 Module actions allow you to change VPS status. 3. 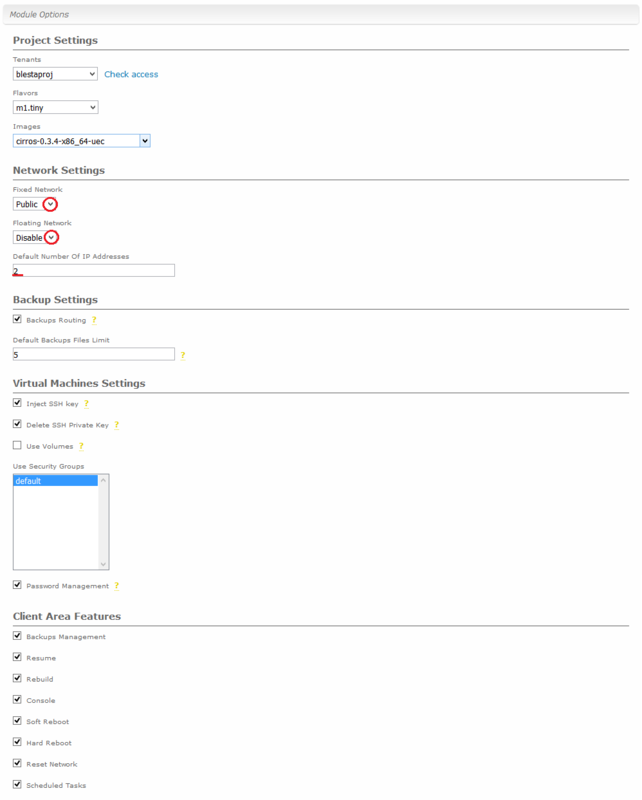 Upgrade/Downgrade option which enables you to view current VPS resources and change VPS specifications. 4. 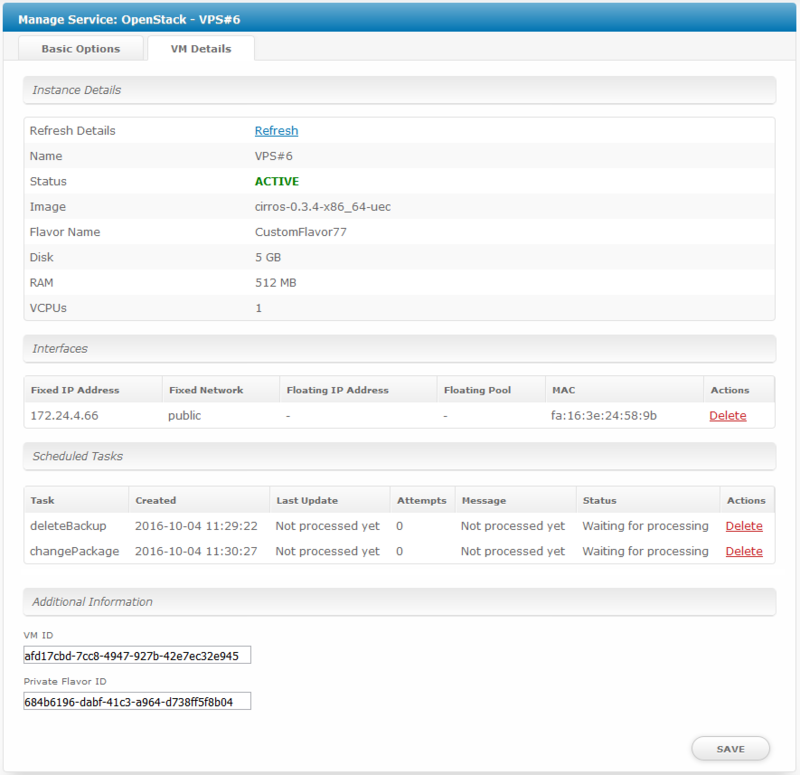 Here you can find VPS details and refresh them through pressing 'Refresh Details' icon. 5. Scheduled tasks status can be found in this table. 6. 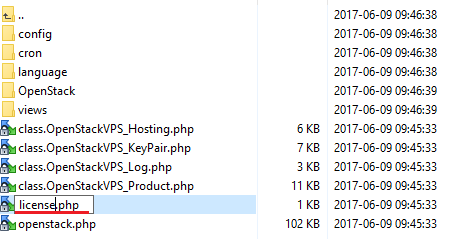 In 'Additional Information' you can find IDs of VM and private flavor. 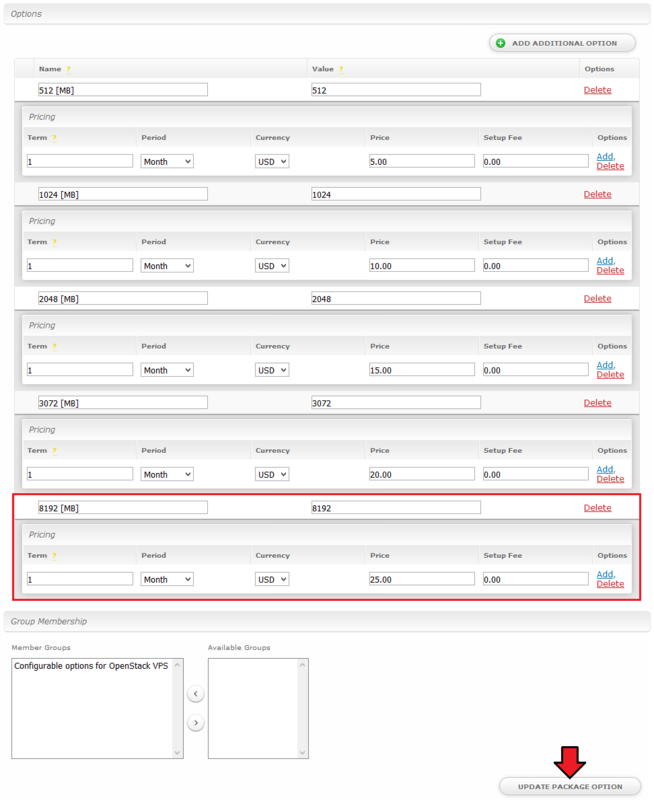 Additionally, you are able to set up pricing for each configurable option, which makes your offer even more competitive. 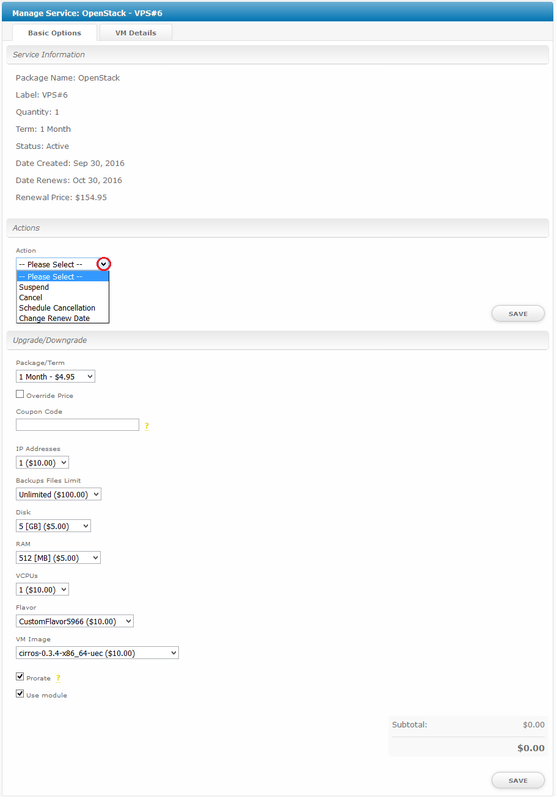 To learn more about configurable options move here. 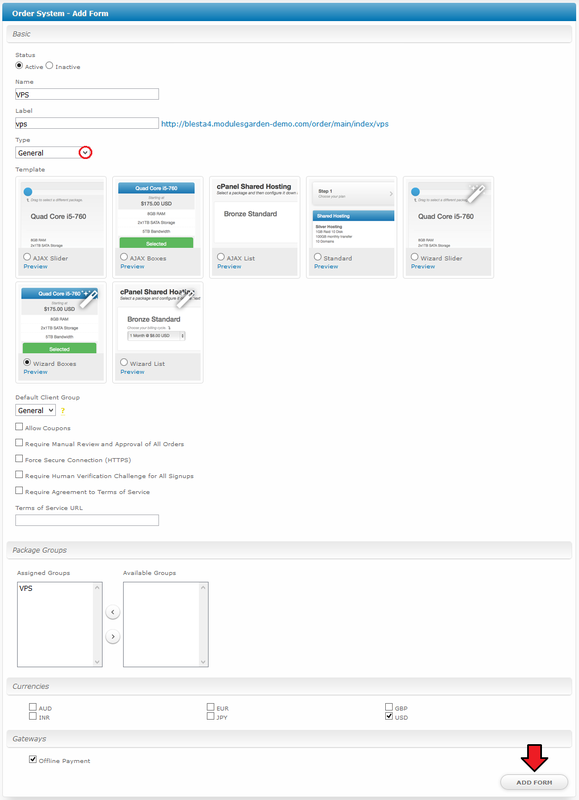 Client area interface of OpenStack VPS should look like the one on the screen below. 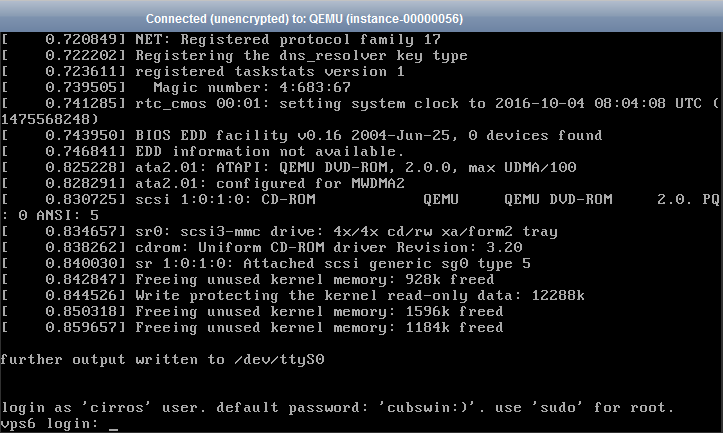 As you can see, control panel contains all the most important information on the virtual machine. At 'Tasks' your customers can view all requested tasks that haven't been completed yet. Each task has additional information bounded to them, like type of task, attempts to perform tasks or last returned response. To reinstall your server, choose an image and confirm through pressing 'Rebuild' button. Now, provide backup name and press 'Backup Now' button. Anothe functionality, access to noVNC console, seems to be one of the most crucial. Thanks to it, your clients can remotely manage server. To access it, simply press the 'Console' button. 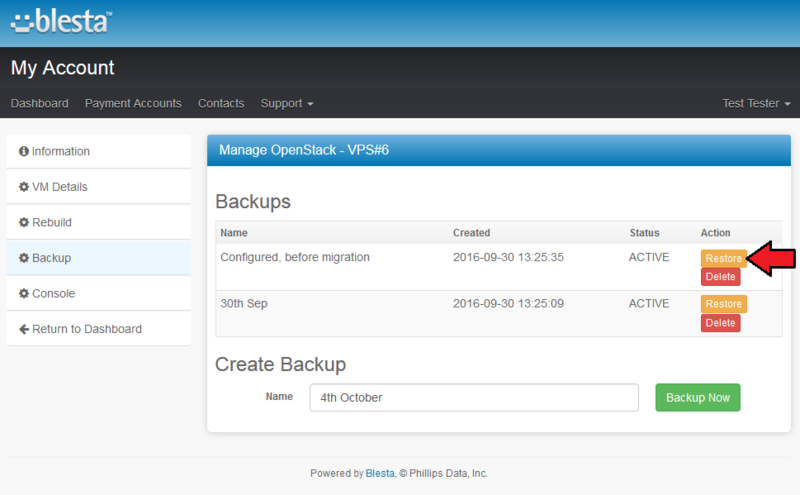 SSH key pair is generated automatically by OpenStack VPS For Blesta. You can easily convert your private Unix key (.rsa) to private PuTTY key (.ppk) using 'PuTTYgen'. 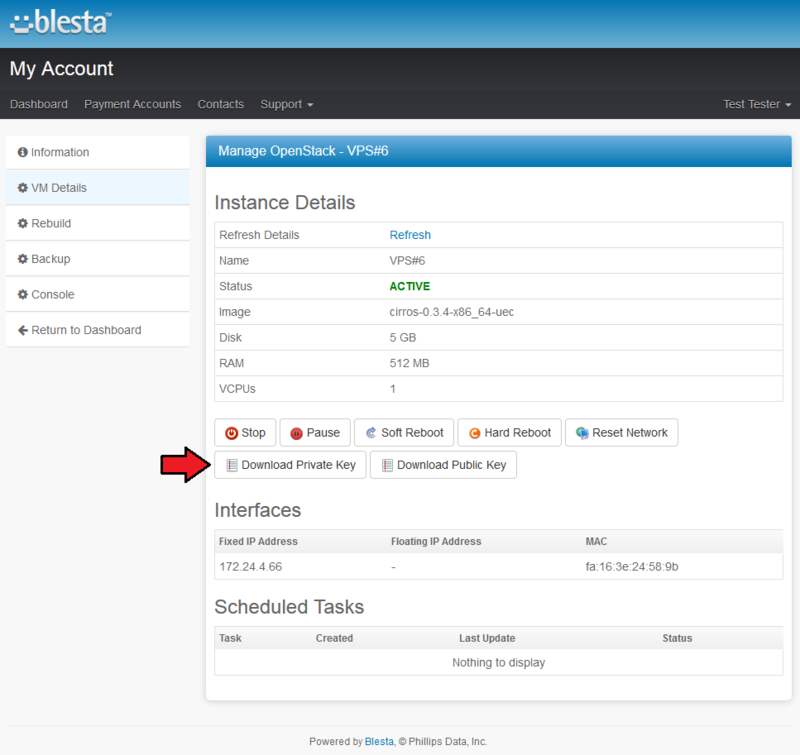 OpenStack VPS For Blesta allows you to set up two types of network. The first one is a network without floating IP address. To set up this type of a network, choose 'Public' as 'Fixed Network' and 'Disabled' as 'Floating Network'. On the following screen you can view exemplary topology of such network. Second type of network is a network with floating IP address. In case standard configuration does not fit your needs, you can adjust it through configurable options. To do so, go to 'Packages' → 'Options' and find the group of configurable options used by your product. To do so, edit 'RAM' by pressing edit button as shown on the screen below. To add new option, press 'Add Additional Option'. Then enter the new option name and value in a textbox under all other options. If you want to replace it with option you currently have, simply edit its textbox. Next, press 'Update Package Option'. 1. Please be advised that using Debug Mode on production system is not recommended. It may cause plenty of error messages being displayed and interrupting flawless work unnecessarily.